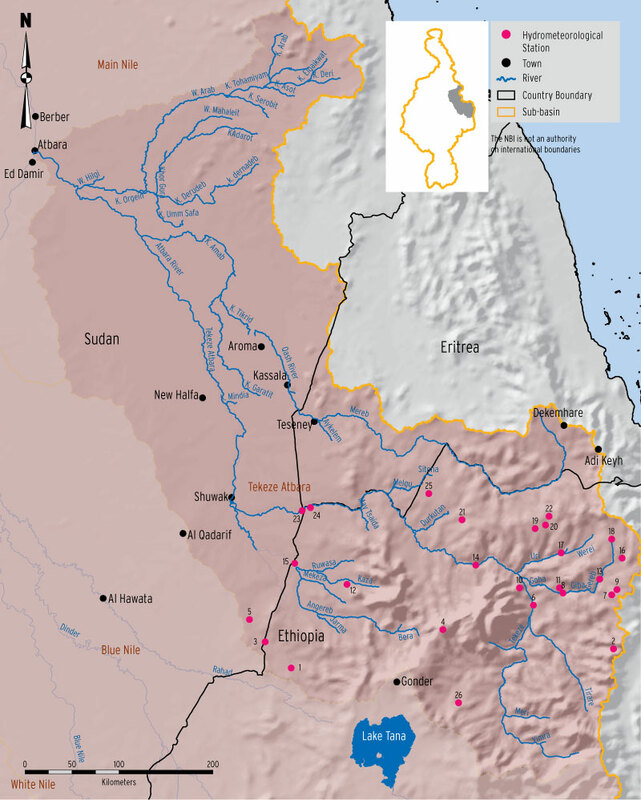 The Tekeze-Atbara Sub-basin: the Tekeze-Atbara drains the highlands of central – north Ethiopia. Its main rivers are the Tekeze (also known as Setit in its lower reaches), Gwang and Atbara, which constitutes the ultimate downstream river reaches. The long-term average annual water yield of the sub-basin is approximately 12 x 109 m3. The rivers are highly seasonal in their flows. The rivers are used to supply water for hydropower generation and irrigation. There are three dams in the sub-basin, the TK5 in Ethiopia (commissioned in 2009), Khashm el Girba in Sudan (commissioned in 1964) and the Atbara dam complex (also known as Rumela- Burdana dam, not yet operational). There are 136 meteorological stations in the sub-basin, with 128 of them in Ethiopia and 8 in Sudan. The distribution of the stations is shown in the map. 30 stations (26 in Ethiopia and 4 in Sudan) are reported to measure the full range of meteorological parameters and the rest 106 measure daily rainfall totals only. 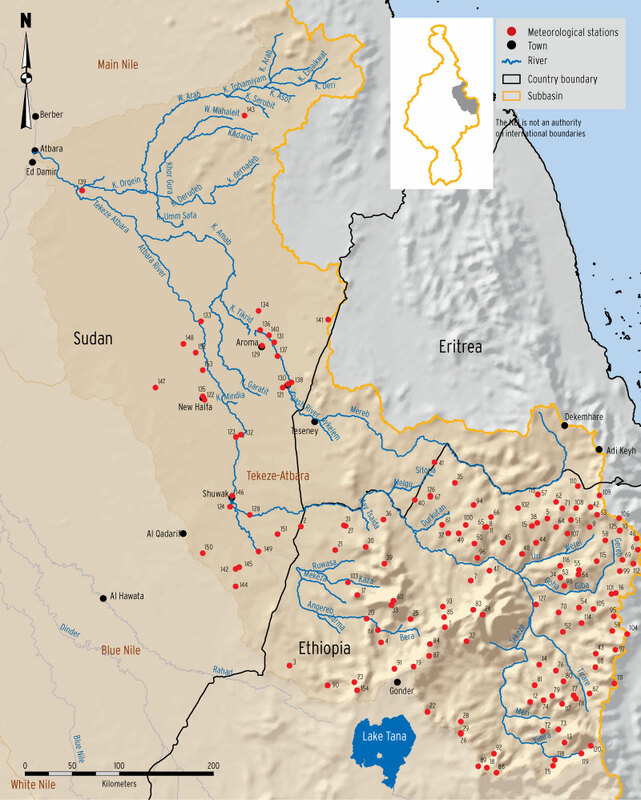 There are 26 hydrometric stations in the sub-basin; 23 in Ethiopia and the rest 3 in Sudan. The oldest station, Atbara near Kilo 3 was established in 1923. Most stations in Ethiopia were established after the mid 1970’s. All stations measure river water level with most stations employing manual staff gauges while 8 stations in the upstream part are equipped with automatic water level recorders. Erosion and sediment transport are key processes in the sub-basin but not adequately monitored. Strengthening sediment monitoring is one of the key areas for improving the monitoring system in the sub-basin. The rivers in this sub-basin are highly seasonal and water resources are scarce compared to the current and anticipated future demands. Therefore, coordinated management of storage dams in Ethiopia and Sudan would help in reducing losses, and maximizing water use efficiency. For this purpose, a real-time data collection and communication system is required to support future coordinated management of water storage dams in Ethiopia and Sudan.